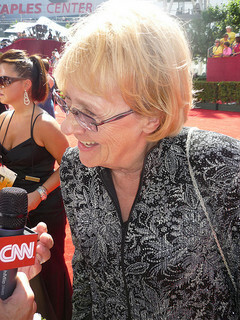 Emmy Award winner Kathryn Joosten who is known for roles on Desperate Housewives and The West Wing, lost her battle against lung cancer on Saturday said her family. Joosten was 72. The actress battled the disease for over 11 years. In a prepared statement, her family said she was surrounded by her loved ones laughing and crying, with lots of humor right up until the end. Her acting credits started in 1984. She had roles on sitcoms on television like Dharma and Greg, Ally McBeal and Scrubs. She was also in movies like Bedtime Stories and Wedding Crashers. In 1999, she received her big break when she received the role of Dolores Landingham, the secretary of the President on the critically acclaimed series The West Wing. Two years later, her character was killed off in the show in a car accident. In 2005, she was cast as Karen McCluskey in Desperate Housewives. McCluskey was an older, crusty neighbor living amongst the many beautiful but often troubled women on the hit series. She earned two Emmys for her performances on the show in 2005 and 2008. Both Emmys were for outstanding guest actress for a comedy series. She agreed to receive a diagnosis of lung cancer on the show and succumb to the disease as part of the storyline of the show’s final season. She said she did not fear doing that, as it would help more people learn about the disease and how deadly it could be. Many actors who worked with her in previous shows such as Rob Lowe and Felicity Huffman tweeted messages once they heard of Joosten’s passing.